Lt. Colonel Purvis, 7 Lower Seymour Street, London, by December 1832. George Barret travelled extensively in England, Wales and Scotland after moving from Dublin to London in 1763. 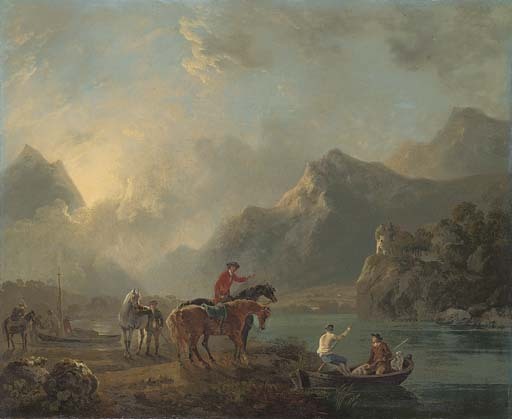 Wales, with its dramatic mountainous scenery, particulary appealed to him with his deep interest in the sublime. Dolbardarn Castle, an ancient English castle, overlooks the waters of Llyn Peris in Caernarvonshire, North Wales. Barret sometimes enlisted the services of Sawrey Gilpin for the staffage in his paintings such as the figures and horses in the present work although, as Brendan Rooney points out, works such as his 'drawing of A Bull (Victoria and Albert Museum) attest to the fact he was in no way technically inadequate in this regard himself' (Irish Paintings in the National Gallery of Ireland, I, Dublin, 2001, p. 41).